Diva Vybes...: "ROCK THE VOTE"
Oh so true! 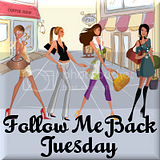 Hope you had a great Halloween:) I am already a follower of yours but I just stopped by from Follow Me Back Tuesday to see what is new with you. Have a great day and feel free to check out our new blog tutorial going on today! Happy Wednesday!